Camp out among tall pines, well above the coastal fog. 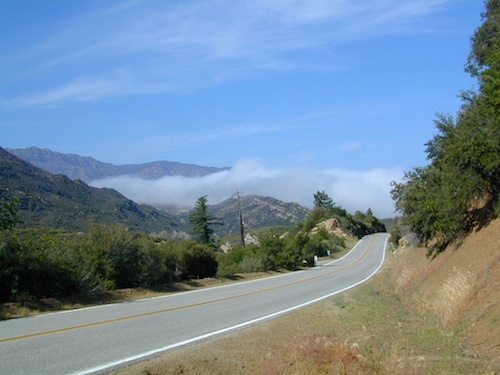 Near the Pine Mountain Summit (elev 5080′) on California Highway 33, the small sign only reads PINE MTN and points east, to a rugged side road. By far one of the worst paved roads around. This Reyes Pine Mountain, should not to be mistaken for the golf course community of Pine Mountain Club, many miles north of here, around the other side of Mount Abel. 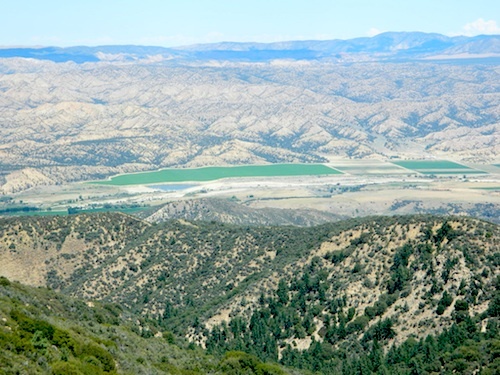 The view above is from one huge dirt pull out, on the left – over looking Ozena Valley, on the west end of Lockwood Valley Rd. Motorhomes, trailers, off-roaders and hunters like this as a last minute camp site, very close to the highway. If your vehicle can endure 9 long miles of poor pavement, pot-holed roads, then maybe you can find seclusion back in the woods around here. 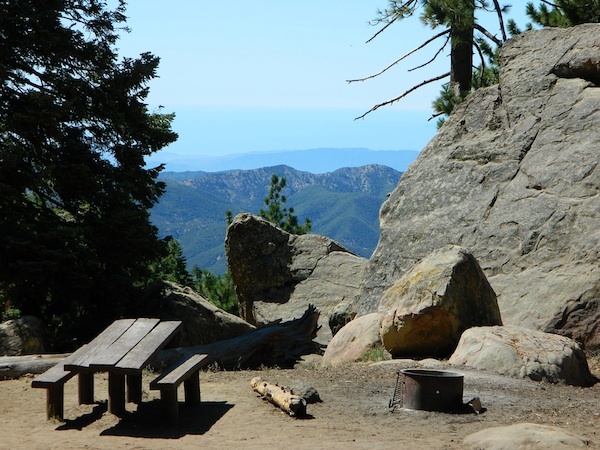 Six or more primitive campsites, spread out along a forested ridge line (around 5000′ elevation). Tables and fire rings only. No fees, no toilets. Bring a shovel and plenty water. No pipes, no running water up here. 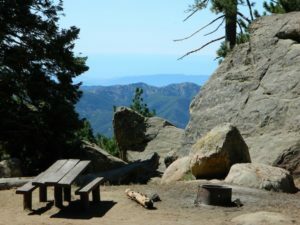 The scattered camp sites are located far enough away from each other, that the location provides some privacy and still relatively close to town. Some sites are in forested settings, while others have big boulders, but are exposed to wind and sun. Although these few sky view camps are perfect for the stargazers. 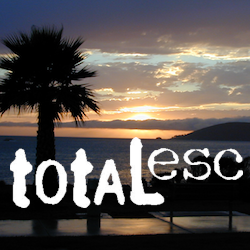 Dark night skies can be okay, if the coastal fog stays low. Neighboring Mount Pinos is all paved – usually best choice for RV campers w/ telescopes, who need large areas of flat level ground. One particular camp site is located at a very decent view spot. Boulders, pine trees and mountain views to the south. Click the image above to expand. 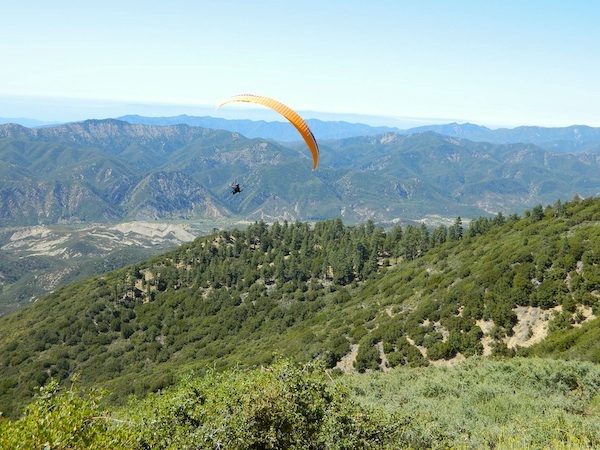 The end of the road is a top destination LAUNCH spot for hang gliders & para-sailers. Watch them jump on YouTube compliments of DanaMite. 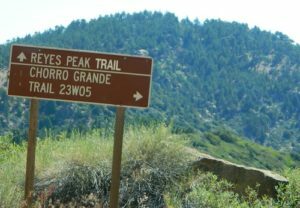 The hiking Trailhead for Reyes Peak and the Chorro Grande Trail #23W05 are also at the end of this dead end road #6N06. 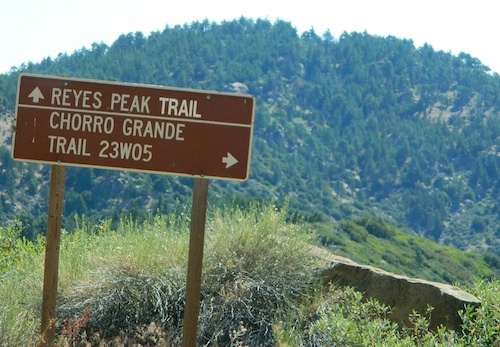 Reyes Peak Trail leads east, out to 7510′ elevation, overlooking the whole lower Los Padres region – Lockwood Valley, Ozena, Piedra Blanca, Sespe Gorge, Potrero Seco. Get outside this weekend. There are no more excuses!